If you have attended one of my cooking class or read my blog, you will know that I often joke about my German husband liking his potatoes so much. He is well aware so when this week-end he heard on the Today’s Show that Potatoes were regarded as a super food and that it was better to eat one medium baked potato than 2 bananas, he teased, teased and teased me some more. What he failed to mention, however, that those potatoes needed to be eaten without additional ingredients to have the benefits mentioned ( hard to do!!! ), but I guess i need to let him enjoy his bragging rights for a while;-). Because I was unable to find the link to the video, I will share with you an article that I found while looking for it. Very interesting;-). The article entitled “The Ultimate Wonder Food” was published on The Daily Mail almost a year ago. 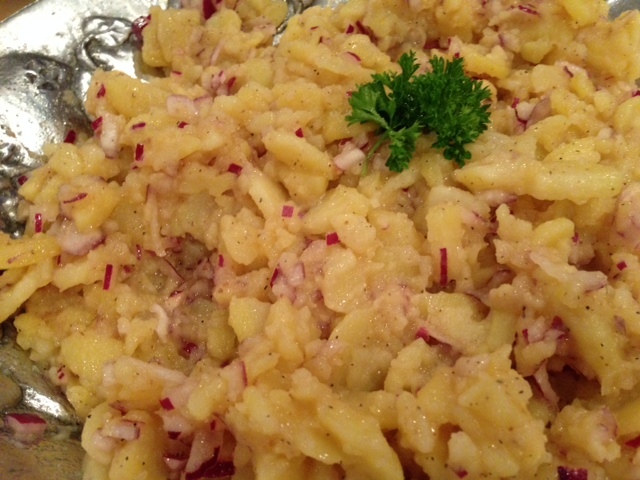 In his honor, I will share with you one of his favorite potato recipe: The German Salad, or also called Kartofelt Salat made the easy way. 1/4-1/2 cup of white vinegar ( it will depend on your taste, personally I like to use 1/2 cup). Cook the potatoes in boiling water until they are cooked, but firm or place them into the large round mold, place the octogonal silpat on the top of the mold and microwave them for 12-13 minutes ( it will depend on your microwave). 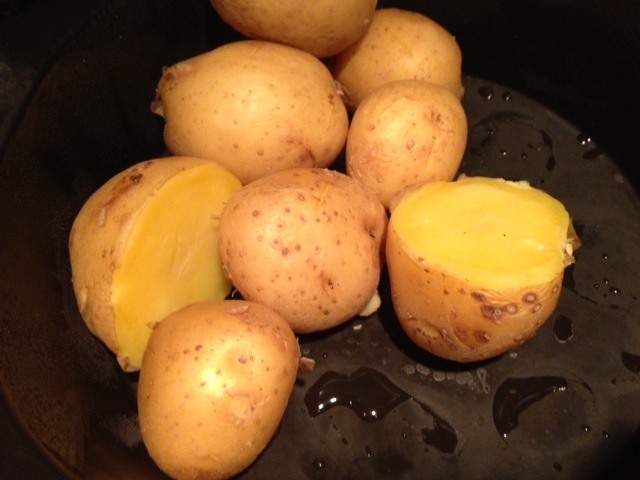 When the potatoes are cooked, grab one with a kitchen towel, peel the skin and slice it thinly into a large bowl. Warm up 1 cup of broth and pour it over the potatoes. Then add the olive oil, the white vinegar and the chopped parsley and mix well. Let the salad sit for a good 15 minutes so that the potatoes will have a chance to absorb the dressing. Et voila!!! Simple, easy and almost as good as the original one cooked in water. Continue the process until you have used all the potatoes. 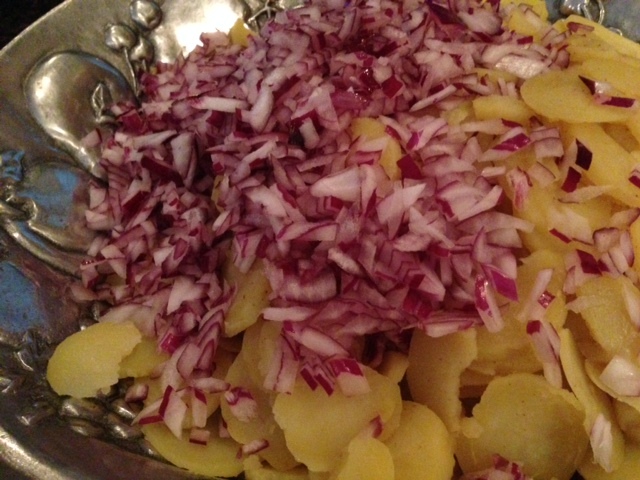 Chop a medium sized onion and add it to the sliced potatoes.